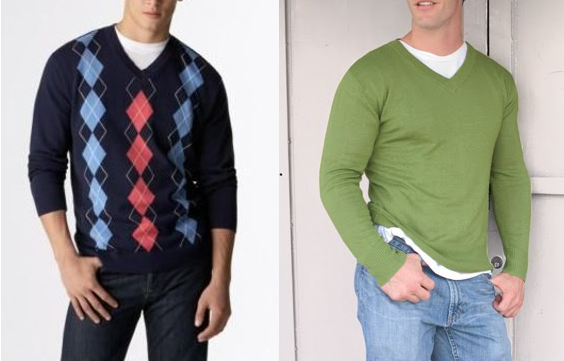 Sweaters are a male wardrobe essential during the colder months; warm and textured, they’re both functional and handsome, and all the different types of them, from the cardigan to the crewneck, can add some nice visual interest and dimensionality to a man’s get-ups, especially when layered with other pieces. 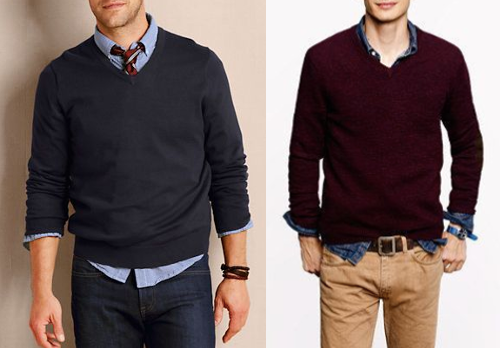 While many sweaters can work well when layering, the V-neck reigns supreme in this area. Its neckline shows off the tie and the collar of the dress shirt worn underneath it, and the fabric tends to be thin and smooth enough to be worn under a sport coat or even suit jacket. 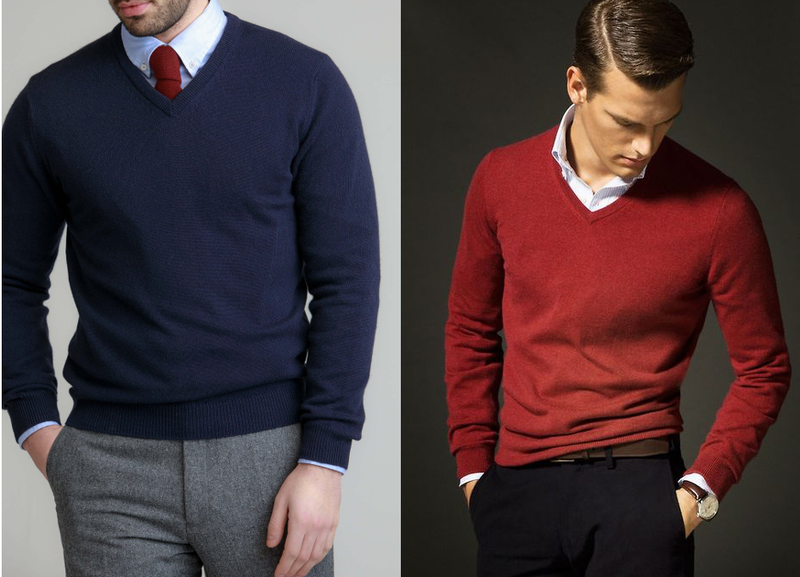 Even when worn on its own, the V-neck typically looks dressier than its crewneck counterparts. It can be clutch for wearing to work on cold mornings, and then removing when the office heater starts to get too toasty, or for attending a play or your next holiday party. 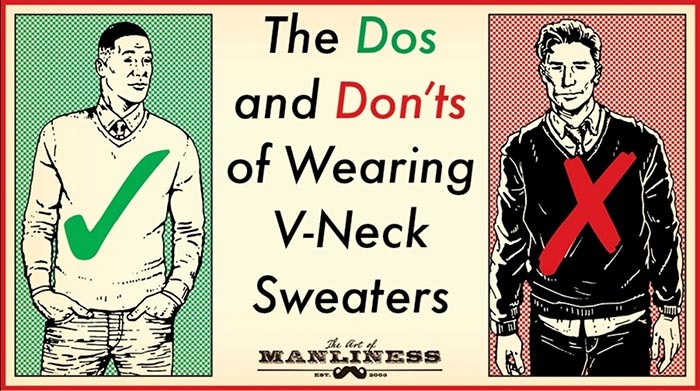 But to keep the V-neck sweater looking sharp, you’ve got to wear it well. Below we outline the dos and don’ts of styling it right. With nothing under it. It just looks tacky. With a t-shirt/undershirt. Do you like the top of your undershirt/t-shirt to show under a tee, polo, or dress shirt? No? Then why is wearing one under a V-neck — which shows even more of your t-shirt than those other garments — an exception? It’s not. It’s a look that reads more like adolescent high schooler than sharp dressed man. With your dress shirt untucked. You might see this on models or in catalogs, but in real life, it just looks sloppy. In a black color. According to some style gurus, this is the most classic color for a V-neck sweater, but I honestly never think it looks good. It’s hard to put my finger on why — perhaps because it almost looks like a suit, but isn’t, or that it looks like the uniform of a parking valet or car rental worker. A sweater that’s too big on left, too small on right. That’s poorly fitted. 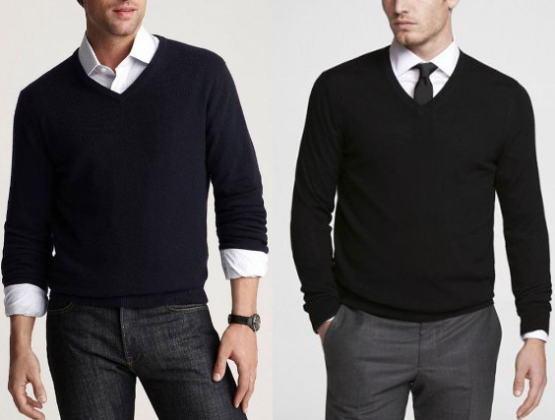 As with all garments, proper fit in a V-neck sweater is foundational. You want the sweater to be neither too big nor too small. A sweater is too big when it’s baggy around the torso, there’s too much bunching of fabric on the arms, and/or it’s too long — with the bottom hem extending for more than 2 inches past your belt buckle. A sweater is too small when it’s too tight on your torso, there’s a lot of wrinkling/pulling around your armpits, you can starkly see the contours of your physique and the texture/details/seams of the shirt underneath, and/or it’s too short — with the bottom hem riding above the bottom of your belt buckle. 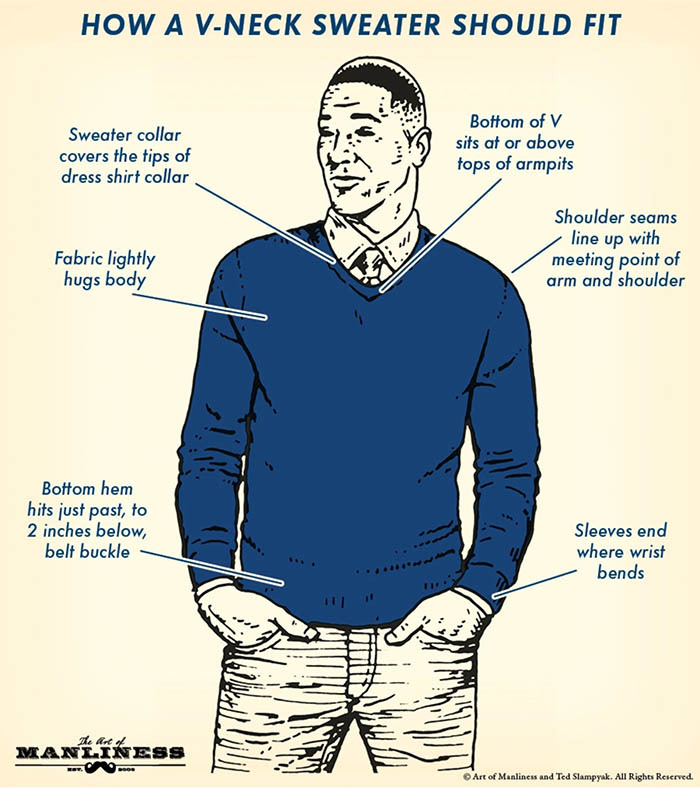 A sweater is also poorly fitted when the V-collar doesn’t touch and cover the points of the collar of your dress shirt, and when the “V” dips too low — it shouldn’t plunge past the tops of your armpits. A sweater needs to fit well right off the rack, as it will be close to impossible to have it altered. 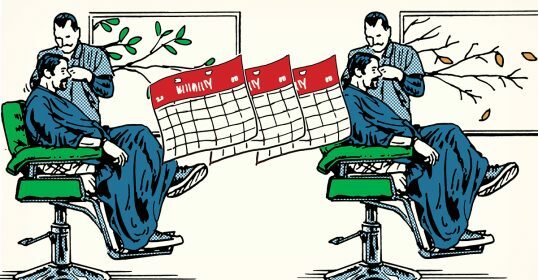 To get an accurate read on the fit when you try one on, make sure you’re wearing the same kind of shirt while doing so that’ll you’ll be wearing under the sweater after you buy it. When choosing a sweater, pick one in 100% wool; cashmere is luxe, but merino works very well at a more affordable price. Over a dress shirt. 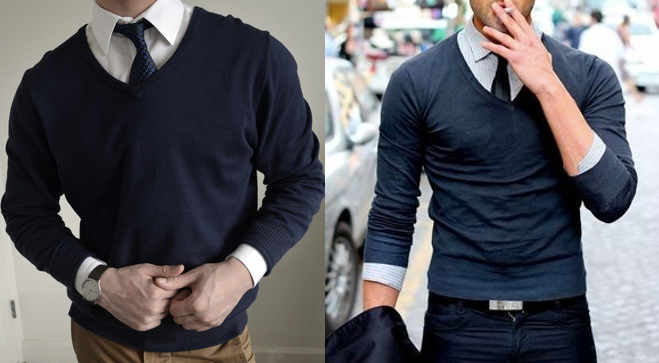 With its smooth, buttery wool, the formality of a V-neck sweater pairs perfectly with a dress shirt; choose an Oxford button-down or a button-up with semi-spread collar in a white or light blue color — a shirt with a pattern can work, but it becomes more complicated to match with your sweater and tie. A dress shirt is also the best under-layer for V-neck sweaters because the cutout collar shows off and frames the collar of your dress shirt, and tie, to handsome effect. You don’t have to wear a tie with a dress shirt + V-neck sweater get-up, but it’s certainly a good look. Since the framing of a V-neck sweater will bring the collar of one’s dress shirt into sharp relief, make sure it’s clean and pressed. Ironing in an extra bit of stiffness and using collar stays can ensure it keeps its shape under your sweater. 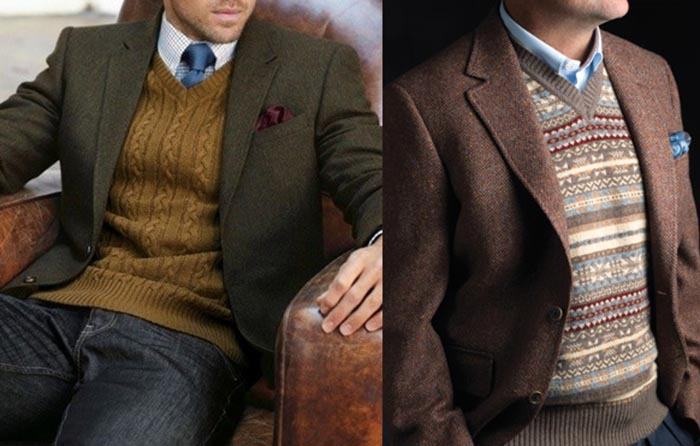 Traditional colors like navy, gray, and burgundy work well for V-neck sweaters, but bolder colors like purple, turquoise, and mustard suit the V-neck well too. Save a straight, bright red color for around the holidays. Under a sport coat. The layering possibilities of the V-neck sweater don’t end with the shirts it goes over, but the jackets it goes so well under: it looks fantastic beneath a sport coat or blazer. 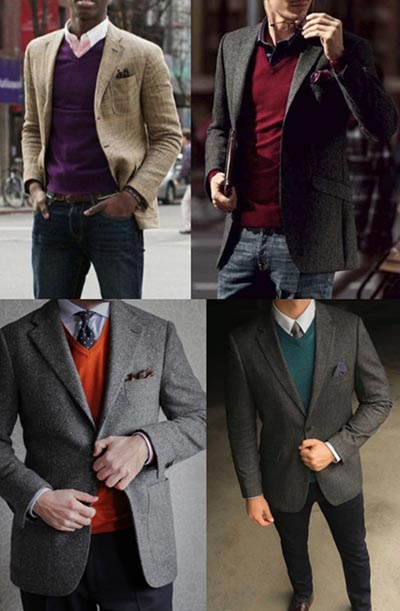 Keep in mind that when you layer you generally want to move your textures from lightest to heaviest — so your dress shirt is the smoothest piece, then the sweater adds a little more texture, and then a sport coat with even more roughness/chunkiness functions as your outermost layer (you can put an overcoat or pea coat on top of all that too, of course). 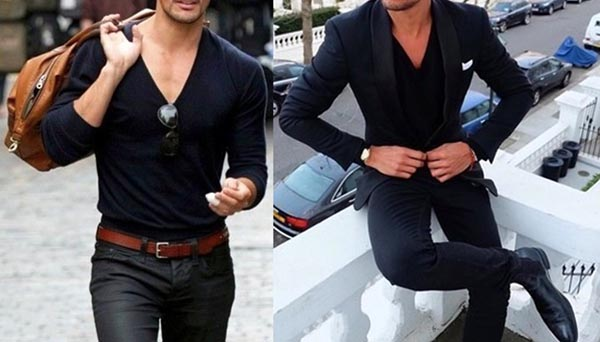 V-necks that have a little more texture themselves, like a cable knit or a more colorful pattern, can look a little off or overly busy on their own, but look much better under a sport jacket. Under a suit coat. 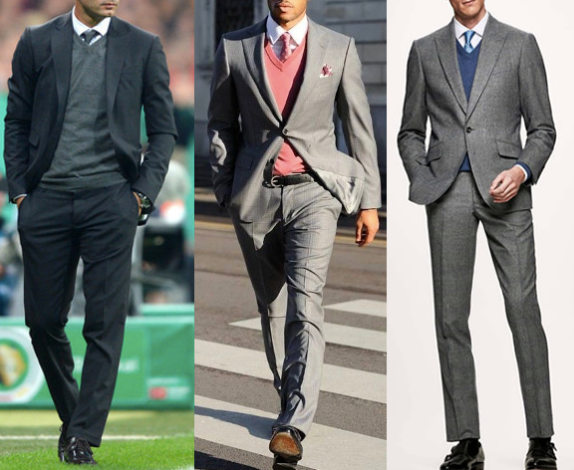 You can also wear a V-neck sweater under a suit jacket — a blue or purple sweater under a gray suit is a very nice look. You may find it more comfortable to instead wear a knit vest to accomplish the same aesthetic effect with less bunching/constriction in the arms, but if you’re going to be out in the cold for a prolonged period of time, having that full-sleeved additional layer over your shirt and under your jacket may be very welcome. You don’t have to follow the lightest-to-heaviest layering rule here; all your layers will be pretty smooth, and that’s okay. To end with some general tips: V-neck sweaters can be paired with dark denim, chinos, or wool trousers, and leather boots or Oxford dress shoes, all depending on whether you’re going for a more dressy or casual look. A gray sweater with navy chinos or jeans, or a navy sweater with khaki or burgundy chinos are good, reliable combinations, but plenty of other combos will work well too. No matter which pieces you put together, if you follow the dos and don’ts above, you’ll end up rocking the V-neck well.